This website is now undergoing continuous construction - We have already added our entire Emerald Eco-City set of slides to the newest updated version of our U.S. Department Of Energy “30 Years Of Lessons Learned” Workshop, which is available on our extensive Zero Energy Design® CD ROM . We at Zero Energy Design® strongly agree. how joyful entertainment can educate and change the world. Disney trained, motivated and relied on his very-successful team of free-thinking, highly-creative "Imagineers." When they opened Disneyland in 1955, it was the most-advanced, integrated community ever conceived. Walt's 1966 original plan for his Experimental Prototype Community Of Tomorrow (EPCOT) was their best community-planning effort ever. It had the potential to become an international role model of integrated, efficient, state-of-the-art solutions to the growing problems of our future cites, (but he died a few months later and his EPCOT vision has still not been implemented yet). Earth’s human population has more than doubled since Walt made his last movie. A billion people are now sadly starving with less than one cup of food per day. Our environment has been badly damaged. We are addicted to unsustainable wasteful lifestyles. Our chaotic megacities are way overcrowded. Their aging infrastructures are failing, and they are rapidly going bankrupt. 21st century sea level rise may inundate low-lying coastal cities around the world. Storm surge is on the verge today (as in New Orleans). IF we do not make radical rapid improvements to future rapid-growth cities, we are now on a terrible path leading toward the potential suicide of humanity, in the 21st century. 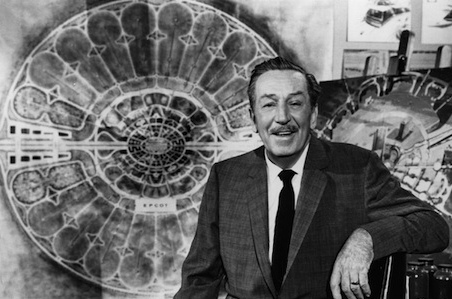 Walt Disney suggested that we could not continue on the path we were on in 1966. We didn’t. Things have gotten much worse! If we do not significantly improve our declining unsustainable lifestyle, it will soon impact all of our lives, prosperity, and posterity. Our recent worldwide economic-and-environmental disasters, corporate greed, and dysfunctional politics are flashing red lights. For the first time in history, in 2008 more than half of our planet's population lived in crowded urban environments. For billions of simple people, the rural environment can no longer sustain the essentials of life. Greedy agriculture corporations, patented genetically-modified seeds, and parasitic Wall Street commodity speculators have stolen the profit motive from family farmers. The need for expensive petroleum to grow food and transport it 1500 miles has become an unbearable financial burden. Farm bill subsidies reward the wealthy, and penalize small-scale organic farmers. The huge urban problems we face today are NOT those that were solved long ago by our parents, grandparents, and founding fathers. After Walt Disney’s death, profit-motivated, uninsightful, Disney Corporation executives dropped the visionary ball and failed to implement Disney’s powerful proposal for his 27,400-acre Florida swampland project. They foolishly laid off Walt's expert Imagineers to cut expenses. IF Walt Disney had lived to complete his vision, the world would have a “City of Tomorrow” role model of what our future SHOULD be, instead of the growing problems that our declining shortsighted cities are facing today. Greedy executives often invest far too little in radical reinvention. Walt said: "I could never convince the financiers that Disneyland was feasible because dreams offer too little collateral." - We must correct this serious flaw in our modern short-sighted financial systems today. 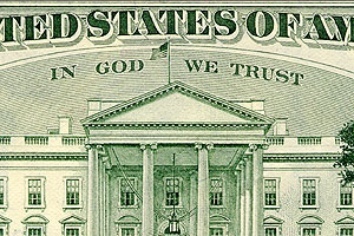 Ironically, lending money for stagnant status-quo declining business-as-usual offers ZERO long-term future collateral! Foolish wake-watching financiers invest trillions of dollars in unsustainable fossil fuels and inefficient egotistical tall megacity glass buildings. BUT, most ignore ecological, efficient, community planning, and safe, clean, off-the-shelf free-fuel energy, which is 10,000 times more abundant than expensive, environment-damaging, deadly fossil fuels. They invest in that which surly will fail, while ignoring the obvious sustainable future. Every valuable human lifestyle improvement began with a tiny spark of unconventional imagination in the creative mind of a prepared imagineer. With status-quo society now facing the very-real possibility of self-imposed unsustainable suicide, the dreams of proven imagineers are worth more than the sum total of all financial assets on Earth today . How much will a ton of gold be worth, if all humans become extinct? Small-scale incremental thinking (based on what now is, instead of what should be) CREATED today's many megacity calamities. We Must Immediately Motivate and Facilitate Tomorrow's Creative Ecocity Imagineer BIG DREAMS and make them happen. You do not need to agree with everything we present, but we hope that our decades of accumulated innovations will provoke your creativity. Walt Disney proved that no vision of the future is whole and complete on day one, but over time, it is refined by collaboration with others. By compressing your learning curve, we are pleased when our apprentice outperforms the mentor, as we pray that you will soon do. Our goal is not to elevate the stature of the mentor, but rather that those who learn from us will be able to solve the many problems that our overly-complex man-made cities face today. We wish that our posterity would learn from the wisdom of the ages, live long and prosper. You do not need to enter anything to view our decades of intellectual property. We are NOT building a profiteering spam list. You alone control which portions of our material you want to access, and when you want to view it. Assimilate whatever you like, and enjoy. We appreciate constructive feedback and collaboration, but you do not need to send us anything, if you want to remain anonymous. Zero Energy Design® proposes scaling up Walt Disney’s motivating live-in EPCOT vision with modern science to create Emerald Eco-City – The world’s largest construction project - Costing over $77 Billion (only $77,000 per occupant), starting on 200,000 acres of low-value land in the U.S. desert southwest, where solar energy is abundant, and no previous infrastructure currently exists. We will create over 400,000 state-of-the-art new permanent jobs. Emerald Eco-City will contain the world’s largest FUN Edutainment Theme Park and Sustainability University - in collaboration with some of the foremost subject matter experts from around the world. Our future ecocity discoveries, development details, and cooperative training programs will be generously made available around the globe on the Internet for the betterment of all mankind. Our endless Ecocity Lessons Learned will Rapidly Refine everything we say and do. We will continually incorporate, integrate, optimize and advance the state-of-the-art of sustainable ecocity community planning. To bring about the radical reinvention of many things, we must depart from declining status quo, business-and-politics-as-usual. Our aggressive approach to rapid innovation necessitates Confrontational Constructive Criticism - in a joyful entertaining way. This website discusses the details of many unsustainable things that cannot be part of any future megacity solutions, AND what we SHOULD be doing instead. Be assured that for every problem we enumerate, we also offer a superior cost-effective sustainable solution. Our Compelling Vision Of The Future has been evolving with over three decades of successful Zero Energy Design® innovations since 1979. Dr. Jonas Salk spent many years developing a vaccine that essentially wiped dreadful polio from the face of the Earth. He then gave it to the world for free. When Salk was asked: "Who owns your polio vaccine?" Jonas always replied "The people! Could you patent the sun?" In the same way, Zero Energy Design® offers our Emerald Eco-City proposal for free, to those with open minds and ears to hear. IF our confrontational CONSTRUCTIVE material can help avoid the world's current path toward the Suicide of Humanity, then it is worth more than all of the gold on Earth. Greedy profiteering is what created today's suicidal path. The thinking that created our problems can NOT solve them. and provide funds to distribute it for free to all of the world? The answer is that compassion and generosity are the path to eliminate that which plagues our chaotic world today. 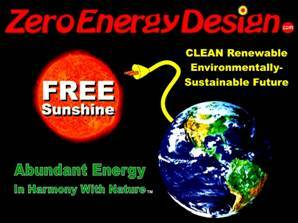 Zero Energy Design® is convinced that we've been given many talents and experience because we have been called to a higher purpose. I will not die until my destiny has been fulfilled. When I finish a video, or put the period on the last sentence of a new page, I wonder if my destiny has been achieved so I can meet my maker, but it has not happened yet. I strongly believe that everyone should live every day in a way that they have nothing to fear from the inevitable end of their mortal body. 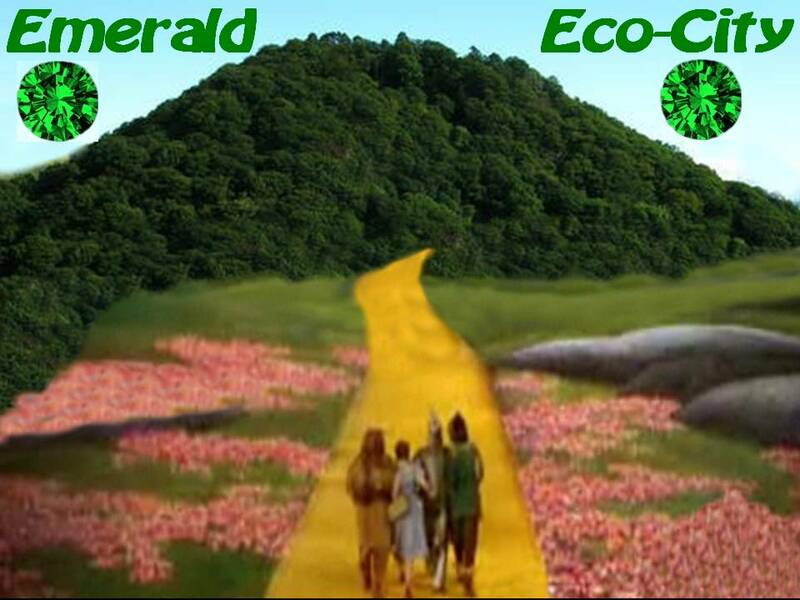 Emerald Eco-City material is our free legacy to those with eyes to see the wonderful potential abundance of living in harmony with Nature. What the Creator of the Universe gave to us freely, we offer freely in return to everyone who wants to live a happy harmonious life. - Want for your brother what you want for yourself. Money does not buy happiness, but generosity does wonders for the soul. We now want to live an abundant happy life in Emerald Eco-City - Very soon we really hope that YOU will too - Smile and Be Happy With Us. You may immediately begin to live in Emerald Eco-City in your hopes and dreams today, and make it reality in your even-happier tomorrow. We hope to help everyone in the world develop a Compelling Shared Vision of What Tomorrow SHOULD BE, (before it is too late). It's not the ultimate destination that matters the most. It is the exciting journey toward our compelling vision that is life's greatest reward. We freely publish this copyrighted material as our legacy to the world. We are not seeking money for our decades of previous work. Our objective is that readers feel helped by our generosity, and inspired to live an abundant happy life in harmony with Nature. We strongly believe that everyone should strive to live a life that is worthy of being remembered, and praise from their posterity. If you choose to live in harmony with Nature and with each other, then may you prosper and share your joy with many others too. What we accomplish in our finite Earthly lifetime is determined by our wishes, prayers, and dreams. We must share a compelling vision and goal of a realistic superior future. to avoid suicide in the 21st century. Emerald Eco-City is the ultimate solution to it all. $4 Gasoline Bankrupted Much of America - What will $6 gas do? The Politics of Energy - "Why not Now"
World’s Lowest Cost per Watt Solar Generator? our countless current crises, can NOT possibly be used to solve them. of Abundant Sustainable Living in HARMONY with Nature. “business-as-usual” greedy, profiteering, mediocre, misguided minds. essential innovations that are long overdue. To Live in Harmony with Nature, we must continually strive to understand the absolute, scientifically-provable, Universal Laws of Nature, as Einstein did. If we tap into the timeless, limitless, eternal energy that created the very fabric of Space and Time, which has tuned and balanced Creation over billions of years, AND, we are Compelled to make every decision based on Living in Harmony with Nature, then who in the world can possibly stand against us for very long? We thank everyone who has sent feedback to help us refine our vision and plans, and those who have purchased our Zero Energy Design® eBook. Please continue to tell your friends and government representatives. We freely publish this website as our Emerald Green legacy to the world. We wish to thank the following 134 countries for visiting this popular website. Our statistics show how many long hours you've spent studying our materials. Please tell your representatives and friends about our happy abundant-life plan. It is sufficient motivation for us to know that so many scholars from around the world are actively seeking solutions to the specific problems we've been working on for over three decades. We do not need more money to continue our development. The Creator of the Universe has blessed us with sufficient funds to retire comfortably, but a life of leisure is not what compels us to fulfill our destiny. We wish this blessing on everyone who thoughtfully reads our many words. WHAT WILL WE DO THEN ? Your ideas and constructive suggestions will be posted on this website on the appropriate page. Copyright 1979 – 2012 Larry Hartweg www.ZeroEnergyDesign.com All international rights reserved - No reproduction in any form without explicit permission.